"Back to Titanic"...BUT...I broke down (Titanic Marketer's dream!) and bought it anyway ("dope"). It is TWICE as good as the first CD! 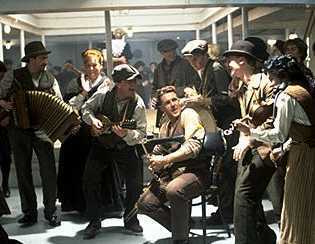 It includes the steerage party song by Gaelic Storm ( Gaelic Storm Home Page ) where Jack and Rose get crazy and they added voice-overs to this song so you can hear Jack and Rose hoop'n while they dance! The piano solo, by James Horner, accompanying the drawing scene is simply mesmerizing! There is also a very eerie sounding version of "Come Joesaphine" with Kate singing the prelude!! Breakes your heart!